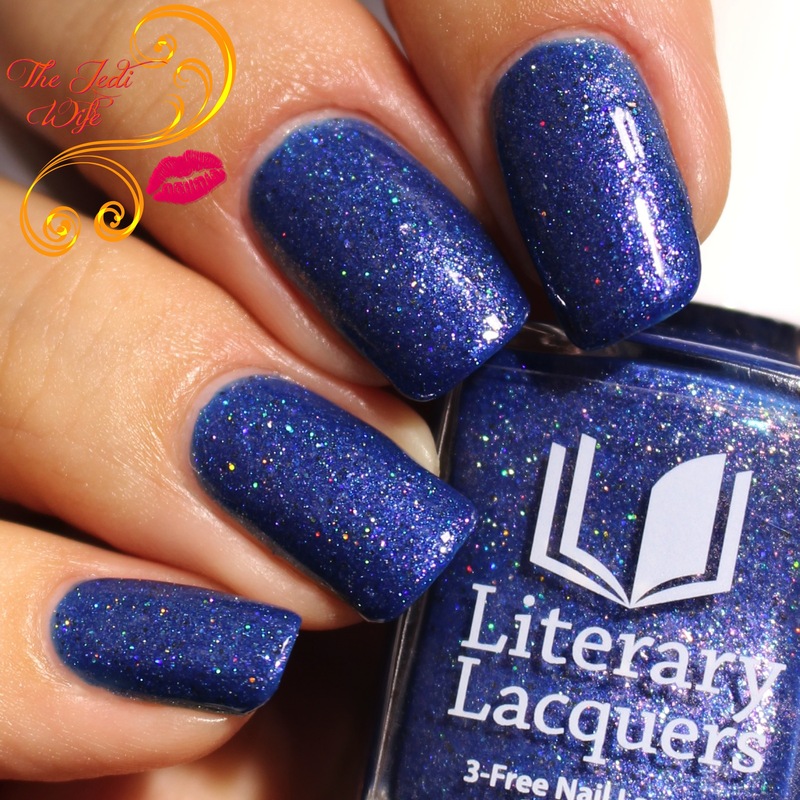 The Jedi Wife Celebrates Five Years with Literary Lacquers! Greetings, dear readers, and happy hump day! I hope you are having a wonderful week! I am awestruck as I write this post and am feeling a little incredulous that I have been here writing for the blog for five years now. What has started out as a simple hobby has taken a life of its own, and I am just as passionate about my blog now as I was when I first started, if not more so. Five years is considered to be a "milestone" anniversary, and to celebrate my blog's birthday, I set out to work with a few different indie nail lacquers brands to create polishes inspired by the gifts associated with five years. 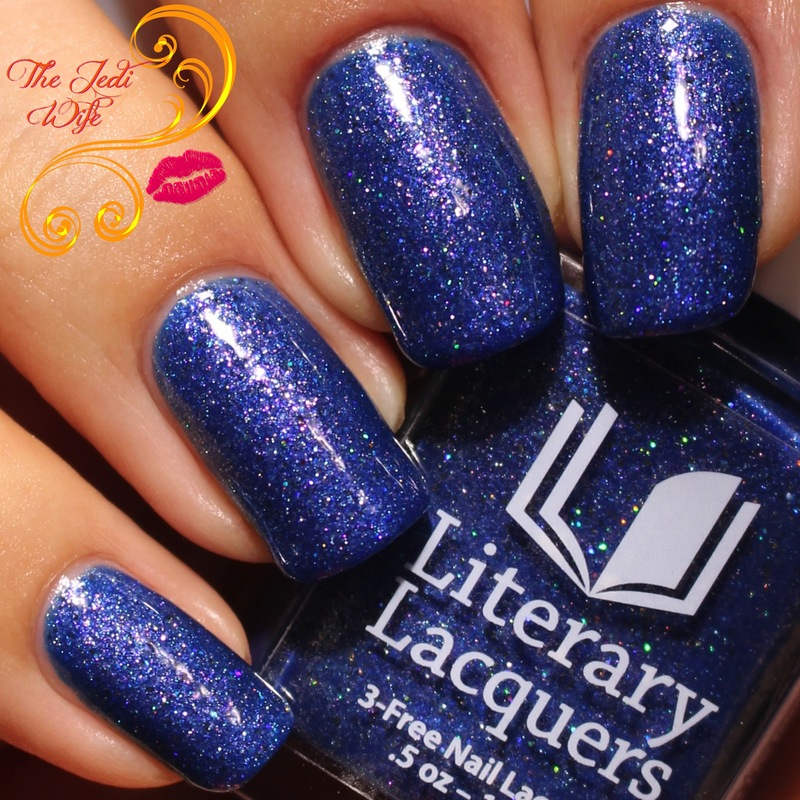 The modern (jewelry) gift is the sapphire, and I couldn't think of a better brand to work with than Literary Lacquers. Amy, the creative genius behind the brand, has become a dear friend of mine over the years, and we share a love a gemstones. Presenting my sapphire-inspired polish: The Happy Prince! 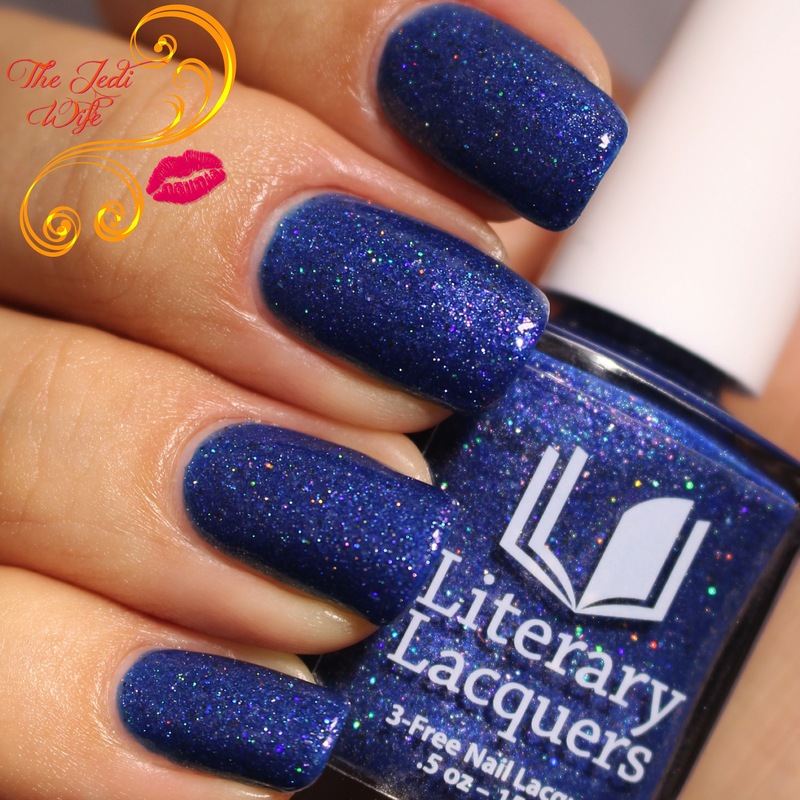 Because of working with the Literary Lacquers brand to create my sapphire-inspired polish, I also needed to pull the sapphire inspiration from literature. In searching for a piece of literature that spoke to me that also referenced a sapphire, I recalled the short story of The Happy Prince by Oscar Wilde. While it was originally written for children, it is a story of riches and poverty, exploitation and sacrifice, and love and compassion. Without giving away too many of the details of the story, the happy prince is a statue with two rare blue sapphire eyes from India that were given to those in need, leaving him blind. While the sapphires are only a part of this short story, they do play an important role and became the inspiration for my blogiversary polish. Due to the origin and suggested rarity in the story, I opted to use the Kashmir sapphire as further inspiration for the polish design. Kashmir sapphires are well known and highly valued for their rich velvety blue attributes, due to the nature of the stone's inclusions. The Happy Prince was designed to emulate these characteristics. I love seeing the design brought to life, and Amy captured my idea so perfectly! Described as a sparkling sapphire blue crelly with a subtle pink shimmer, this polish is so much more! It also contains pink glass flecks, pink flakies, silver microflakies and silver, clear and black holo microglitter. It is definitely a complex beauty! Even with all the elements added, the formula is sublime with smooth and even application from the first coat. I have it shown here with three coats plus top coat, but you may find you only need two coats if you tend to paint in slightly thicker coats. Two coats was actually enough for me until I had my nails under my bright light set-up where I then detected a little visible nail line on one of my nails. The sun decided to pop out from the clouds very briefly, and I was able to snap a quick photo in the sunlight. 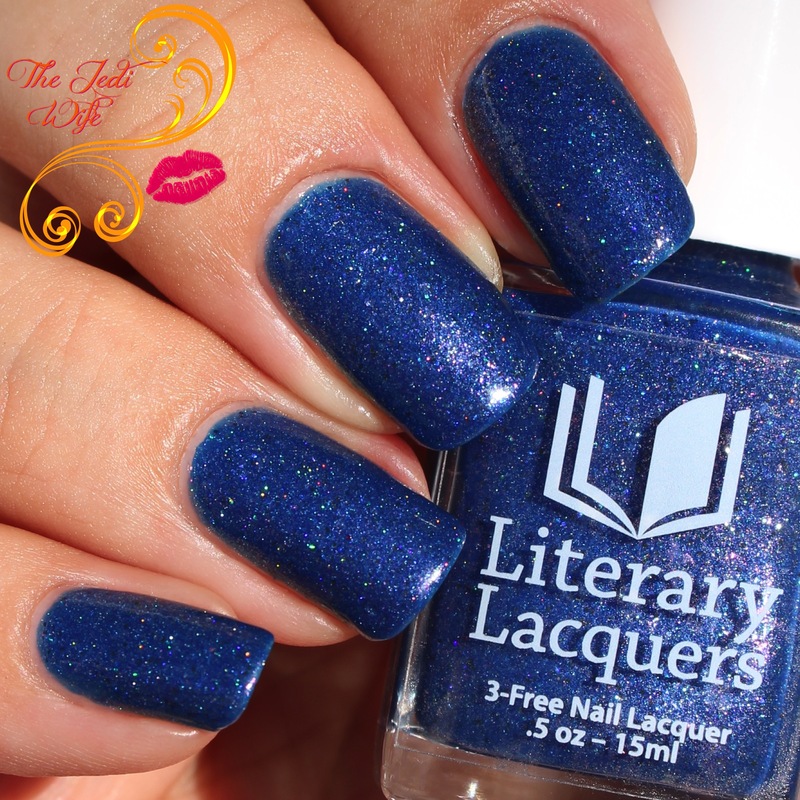 Now for some great news: even though this was created for my blogiversary, you can purchase this spectacular blue polish at the upcoming Literary Lacquers Pop Up event the first weekend in February! The Literary Lacquers Etsy shop will open in its new format Friday, February 3rd at 8pm MST through Sunday, February 5th at midnight MST. While The Happy Prince is not being considered a limited edition polish, Amy does not have plans to stock it again after the pop up event. I know I'm biased, but I'm convinced everyone needs this magnificent blue polish on their fingertips! To all my readers, from those that have been with me from the beginning to those that have found me recently, thank you so much for your support. My blog has seen me through three moves, two babies, and numerous adventures of Cosmoprof North America, the Indie Shops, and Polish Con to name a few. I look forward to seeing what this next year brings my blog, and I hope you stick around with me! I also have other polishes coming up soon inspired by other gifting ideas based on the five year anniversary, and I hope you love those too! nicely swatched! Good luck for your blog in 2017! This is so sparkly and beautiful. I wish we had more sunshine in Ohio right now for holos! Happy Blogiversary!!!! I just had my 10th and it doesn't feel like that long! Oh wow, congratulations on 5 years! This polish is a gorgeous way to celebrate! Another beauty! Thank you for sharing with us. Congratulations on such an important milestone! Here's to five more years and more gorgeous celebratory polishes! This is a stunning polish! Congrats on 5 years - that is an amazing run! Happy blogiversary. This is a gorgeous polish. Very pretty! Congratulations on 5 years! Amazing accomplishment! Many congrats, and a gorgeous polish! Happy 5 year blogaversary Jen! <3 This polish is amazing and it's perfect to celebrate with. Happy blogiversary! That is a serious milestone, especially in the blogging world. Can't wait to see what 2017 brings you, especially if you're helping to bring these gorgeous shades to life! Gorgeous polish! I'm coming up on my 5 year anniversary, too, in April--amazing how time flies, isn't it? That is a stunning blue! Love your nails, btw! Congrats! This is a great blue. Love it! What a beautiful, rich blue! Congrats on another blogiversary!!! Five years is a great milestone! This is a beautiful, rich blue! You and Amy always do a great job working together. Congrats on the blogiversary! Five years is a wonderful milestone! Here's to many more!